The ancient Chinese created a system of medicine thousands of years ago that is still used to this day. It has evolved over time and is still used effectively to treat modern diseases. Chinese medicine is only a part of a greater concept the ancient Chinese used to live their everyday lives. It is a branch that springs from a larger tree that encompasses all aspects of life. This is why the doctor of Chinese medicine does not only deal with the body or physical aspects of one’s health, they are teachers educating patients on how to live a healthy and balanced lifestyle, because this is how we attain health, and the Chinese knew it. It is deeply entrenched in their medicine. Chinese medicine teaches to live in harmony with the seasons, and according to Chinese medicine theory, there are five seasons – winter, spring, summer, late summer, and fall. Each season has many associations which help us to change our habits as the seasons change so that we may create more balance between our bodies and the external environment. When Chinese medicine was being developed thousands of years ago, people were living in a state of complete harmony with nature. They rose with the sun, ate what grew in each season and were acutely aware of their natural environment as it had a direct effect on every aspect of their lives. The lives of the people had a flow that changed depending on the time of year. Things like what foods were eaten were dependent on what happened to be growing at that particular time and what was available. When to get up, how to dress and what kinds of activities were engaged in were dependent on the important connection that people had to their environment. Because these simple steps were taken people were able to stay healthy throughout the year and had the tools to keep their immune systems and their organs strong so that they could ward off disease. Winter represents the most Yin aspect in Chinese medicine. Yin is the dark, cold, slow, inward energy. This is compared to the Yang of summer whose energy represents light, hot, quick, expansive qualities. The summer weather is warm, the days are longer and people are out being active. In TCM we believe that the diet and activities in winter should be adapted to enriching yin and subduing yang. Winter, in TCM, is associated with the Kidneys which hold our body’s most basic and fundamental energy. It is believed that by harmonizing oneself with the seasons you can stay healthier and prevent disease, so winter is a good time to strengthen the kidneys. Rest is important for revitalizing the kidneys, which is why some animals hibernate in winter. It is also a good time to look inward, reflecting on ourselves with meditation, writing, or other inward practices such as Tai Chi and Qi Gong. 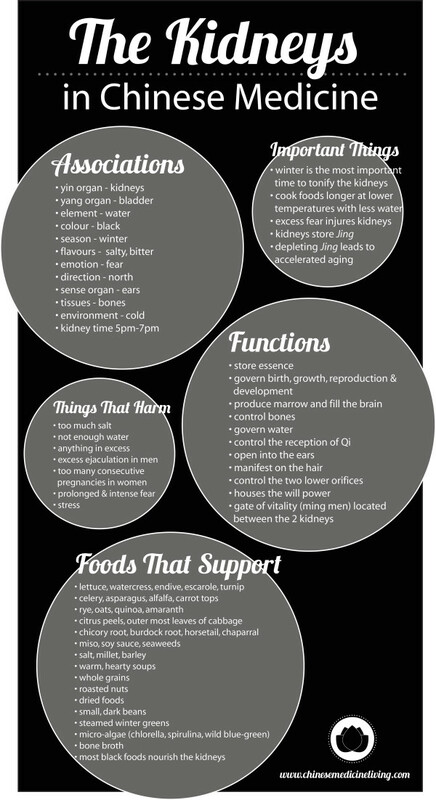 These practices help us to connect to our inner selves and help to support kidney energy. They are very helpful to relax the mind, calm our emotions and raise the spirit. The sense organ associated with the kidneys is the ears, and our ability to hear clearly is related to kidney health. The quiet and stillness of winter allows us to hear more of the world than the buzzing activities of summer. This forces us to slow down, rest and relax. The body part associated with the kidneys are the bones, so it is important to pay close attention to the bones in the winter months making sure to tonify and heal any problems in this area. This is also why winter is a time when Chinese medicine prescribes bone broths as nutritional therapy, as they are warming, nourishing and especially good for the bones. Bone broths are also powerful Jing tonics, as Jing is produced by the bones. Jing is depleted by activities such as extreme and prolonged stress, lack of sufficient sleep, working long hours, and excessive behaviours like too much drinking and drugs. Winter is the best time to supplement the body’s Jing supply and bone broths are just what the doctor ordered. Activities should represent the season with a turn inwards, with more self-reflection, quiet time writing, meditating, reading and other soul-nourishing activities. Winter is a time to slow down and feed ourselves both physically and spiritually. Internal martial arts and meditative practices are particularly helpful at this time of year. One should go to bed earlier and sleep later to receive the full healing effects that sleep has to offer. Many people love winter. They feel energized with the coming cold and love to be out snowboarding, skiing and going for walks in the snow. For others, winter causes them to retract, stay inside and can cause some to feel sad or even depressed because of the lack of light and reduced physical activity. The good news is that winter can be enjoyed by everyone if we live, eat and exercise according to the season and pay attention to our bodies preferences. There are many foods that are beneficial for us to eat during the winter season. 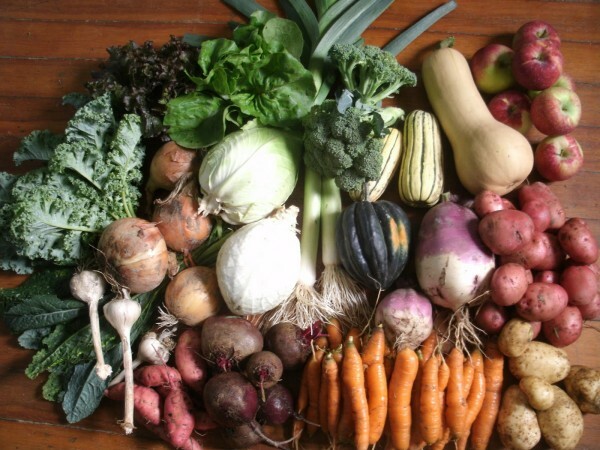 These foods are the ones that naturally grow in this season – squashes, potatoes, root vegetables, winter greens, carrots, cabbage, mushrooms, apples, and pears. In winter, our bodies need warming foods like soups made with hearty vegetables, and rich stocks cooked with animal bones are best. Foods that specifically nourish and warm the kidneys are; black beans, kidney beans, broths cooked with bones, lamb, chicken, walnuts, chestnuts, black sesame seeds and dark leafy greens. A small amount of unrefined sea salt is also helpful as the taste associated with the kidneys organ is salty, but remember, moderation in all things is important. Cooking should be for longer periods using low heat and less water. This infuses foods with heat that helps to keep the body warm in the cold winter months. 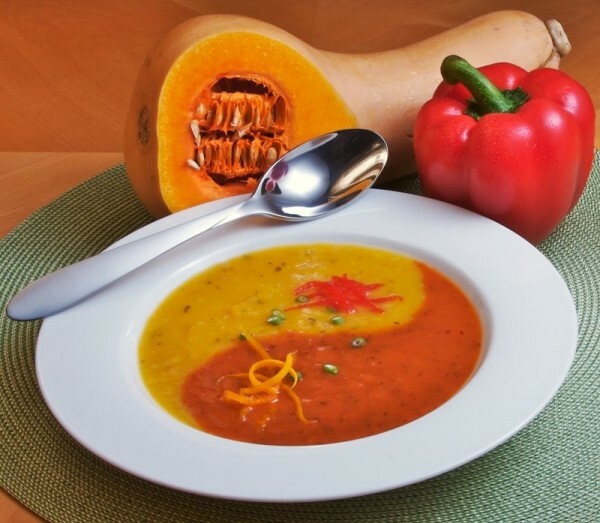 Hearty soups, whole grains, and roasted nuts are good on cold days and offer nourishment to feed the body and tonify the kidneys in cold winter months. The principle of harmony between what we eat and the season is based on hundreds of years of practical experience. Chinese nutritional therapy is an important component of Chinese medicine and truly believes that you are what you eat. The food that we consume has a profound effect on the body, affecting our health and wellbeing. Foods become part of the body after being consumed (internal) and the weather and environment have an effect on us externally. Chinese dietary philosophy suggests that you embrace native foods along with eating locally grown, organic and chemical free foods that grow in season. According to TCM the thing about the modern diet which is the most unhealthy is that we are able to eat foods all year round that may be grown unnaturally with the use of pesticides rather than ones grown naturally for only part of the year. This is the way nature intended us to eat. Eating natural foods that grow in the present season is what our bodies are designed for and prefer. This is one of the main ways that Chinese Medicine guides us on how to remain healthy all year long. Why I decided to blog instead of dancing. Lot of things are similar to Ayurveda.